A dedicated Military History Book has never before been written about the 31st Battalion AIF involvement in WWI. It’s interesting to reflect as to why it has taken near a century before the Story of such a courageous band of men was told. The Battalion was raised in August 1915 at Enoggera Brisbane with members being recruited from throughout Queensland. Two further Companies were formed at Broadmeadows in Victoria. 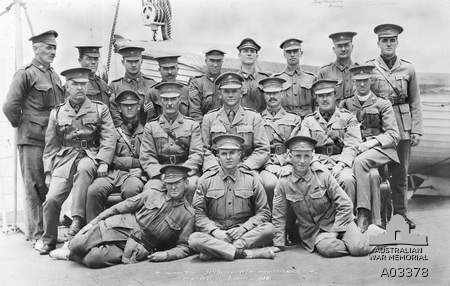 In October 1915, the Qld and Victorian Contingents were combined at Broadmeadows before the Battalion sailed for Egypt in November. In the post Gallipoli reconstruction of the AIF the 31st Battalion formed part of the 5th Division AIF. During July 1916, the 31st Battalion entered the trenches on the Western Front. Being immediately, thrust into readiness for the Battle of Fromelles on the 19th July 1916. The 31st Battalion’s advance at Fromelles was courageously undertaken by its men – their story is one that all Australians should read and be proud. The 31st Battalion, CO Lieut.-Col. Fred W. Toll who was from Charters Towers lead from the front in the advance. Toll was a highly experienced leader who had completed two tours during the Boer War. One of which was served with the British Army and the other 2IC 5th Queensland Imperial Bushmen. Earlier in WWI, he was the Major to command the 3rd Battalion of the Australian Naval and Military Expeditionary Force (AN&MEF) at Rabaul. Sadly, the 31st Battalion suffered heavy casualties before leaving their Fromelles trenches due to Australian artillery dropping short – Toll was himself wounded in the head. during the Battle of Fromelles. The Battalion was under fire from the Germans on three sides and was suffering once again from being bombed by their own artillery. Further German trenches could not be located so Toll had to retire to the first German trench. Toll sent a message at 7.14 pm that ammunition was urgently required. The situation never bettered and ammunition could not be brought forward in the quantity required (the Australian ammunition dump had caught fire). Eventually at great cost, they had to retire back to the original Australian trenches. 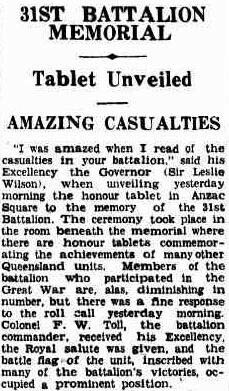 Toll was awarded the DSO medal for his gallant command of the 31st Battalion at Fromelles. The Battle of Fromelles was a disaster for the 31st Battalion suffering 572 casualties, over half of its strength. 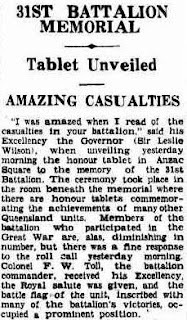 Due to the Fromelles loss, the Battalion did not take part in another major battle until September 1917 at Polygon Wood where the 31st Bn soldier Paddy Bugden was awarded posthumously the Victoria Cross medal. The Battalion participated in the Battle of Ameins on 8 August 1918 and the following attacks on the Hindenburg Line and Villers-Carbonnel. The 31st Bn fought its last major action of the war in September 1918 when the 5th and 3rd Australian Divisions, and two American divisions attacked the Hindenburg Line located on top of the St Quentin Canal tunnel near Nauroy. The author, Neville Browning is a highly experienced Australian Military Author. He has written a large detailed history. 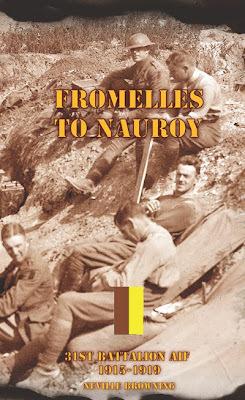 Like all his books, FROMELLES TO NAUROY is superbly produced to the highest standards - 464 pages printed on higher quality anti-aging paper, case bound, wibelyn (cloth) covered with a dust jacket – a true collector’s volume. King and Cobbers: Battalion History Book of the 51st Battalion AIF WWI. Leane's Battalion: Battalion History Book of the 48th Battalion AIF WW1. The Blue and White Diamond: Infantry Unit History of the 28th Battalion AIFWWI.